Do not be afraid to buy classic and vintage instruments. Many of these classic keyboards and classic drum machines, had a fat, analog sound to them. 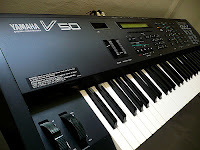 Many older synthesizers are amazing too. You can tweak the sounds with them. There is nothing wrong with creating music with old gear. Many of them use old school floppy disks to store data. They all are unique in their own way. Classic sounds. Here is a short list of some amazing gear that have a classic sound. This is just a sample of electronic instruments that have an amazing sound. If you ever come across one of these for a good price, buy it and use it.